The ABC unit is composed of officers and civilians who work closely with the said partnerships. The ABC Unit educates alcohol establishments on how to comply with the local and state alcohol ordinances. The ABC Unit works with federal, state and local law enforcement agencies throughout the state on underage alcohol sales. ABC also conducts operations for special events or festivals where alcohol-related disturbances tend to occur. Our mission is to improve the quality of life in Savannah though the fair and impartial enforcement of laws and regulations governing the serving, selling, distribution, and consumption of alcoholic beverages. City & County Property Maintenance. Attend neighborhood meetings concerning alcohol issues and businesses that are petitioning for an alcohol license. Compliance/Inspection Checks: Inspect for violations of the City’s Alcohol Ordinance and regulations. Underage Alcohol Sales: Investigate the sale to and consumption of alcohol by underage individuals. The Bomb Squad (now EOD) was originally started by the former Chatham County Police Department in 1994 for the purposes of having a team able to respond to explosive incidents in the Chatham County area. They also assisted with securing the Summer Olympic water trials being held in Savannah that year. Under the merged Savannah-Chatham Metro Police Department, the unit grew in size. During this time a new Operations truck was obtained along with newer bomb suits and render safe tools. 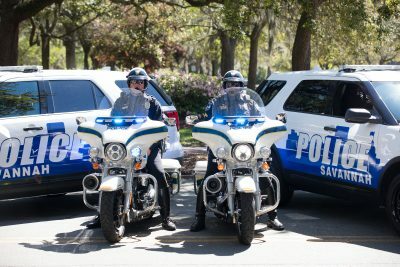 The unit remained a part of Savannah Police Department after the 2018 de-merger of Savannah-Chatham Metropolitan Police. The Explosive Ordnance Disposal team is responsible for rendering safe suspicious packages, assisting military Explosive Ordnance Device (EOD) units with the destruction of explosive ordnance and assisting SWAT with barricaded gunman calls. The team currently has 13 members, six of whom are certified graduates of the FBI Hazardous Device School in Huntsville, Ala., the only civilian Bomb Technician School in the United States. SPD’s EOD team has a tactical medic partnership with Southside Fire/EMS services, one of the few on the East Coast, as an additional safety measure for departmental personnel when on an incident callout or conducting explosive range demonstrations. Being an SPD bomb technician involves, in addition to regular job assignments, a 16-hour monthly training requirement, teaching recruits at the Georgia Safety Training Center in Garden City and attending public safety functions. Candidates for the EOD Team must have at least five years with the department, have obtained their Hazmat Technician certification, and have passed a departmental physical agility test before being considered for the six-week Hazardous Devices School in Huntsville. The team maintains a working relationship with its military counterparts at Fort Stewart, Marine Corp Beaufort Airfield, and Kings Bay Naval base. Advanced training is also held with Savannah Fire and Emergency Services Haz-Mat team. The team currently has One Farber Chevrolet 35’ operations truck, a 4X4 Ford pickup truck for towing around the single vent containment vessel, and a John Deere 6X6 utility vehicle for special missions requiring rapid deployment of men and equipment. The team has two robots, a REMOTEC F6A Andros and a TALON responder. It also possesses a NABCO trailer mounted Mobile Thermal Destruction Unit (MTDU) used in the elimination/dispersal of old ammunition, drug evidence, and chemical propellants. The Georgia Crisis Intervention Team (CIT) Program is a collaboration of professionals committed to assisting persons with mental illnesses and other brain disorders. This collaboration includes local members of the National Alliance on Mental Illness (NAMI), mental health service providers, family members, and law enforcement officers. The most important aspect of the CIT Program is the training provided to law enforcement officers. CIT trains law enforcement officers to effectively and humanely interact with persons with mental illness. The CIT course is a 40-hour, five-day curriculum that is approved by the Georgia Peace Officers Standards and Training (POST) Council. It is comprised of both classroom instruction and practical exercises delivered by mental health professionals, other subject matter experts and CIT law enforcement instructors. When a public safety situation occurs involving a person in psychiatric crisis, law enforcement officers will be the first responders. The officers are responsible for handling the incident in the most professional manner possible. CIT training provides officers with the tools to professionally and humanely interact with persons with mental illness. Often situations involving psychiatric crises are higher risk and may escalate quickly into a situation where use of force may be a necessity. The CIT training will provide officers with skills that can minimize risk to responding officers and the person in crisis and may prevent the need to use force all together. Although the use of force may ultimately be necessary in some situations, we know from experience that the de-escalation skills learned in CIT training often reduce the level of needed force. Also these communication skills can be an invaluable tool to officers in their regular duties. The SPD Training Unit extends the opportunity for other agencies in surrounding areas to attend CIT Training when it is offered at SPD. Since the program’s inception at SPD, approximately 750 officers have become certified CIT Officers. The Savannah Police Department’s Honor Guard was formed in 1975 and was commanded by Sgt. Clark with the assistance of Cpl. Pendergraph and Officer K.C. Daniel. The Chatham County Police Honor Guard was formed in 1975 and was commanded by Cpl. James Hieronymus, assisted by Officer P. McBurney and Officer P. Leopold. Today the unit is under the direction of Lt. Torrance Garvin. The Honor Guard consists of more than a dozen sworn officers. These officers are all volunteers and range in rank from the newest recruit to 20-year veterans. They are expected to perform their regular jobs within the department, yet come together, as needed, when their services as guard members are required. The unit performs at various events sponsored by the department, as well as attending funerals for fallen officers in and out of the state. Through the years, the Honor Guard has received many compliments for its unique way of comforting the families of our fellow police officers who gave the supreme sacrifice. The Honor Guard performs rifle salutes and flag-folds at funerals for line-of-duty, active duty and retired officers. The Honor Guard’s most important mission is to honor the fallen heroes of law enforcement and their survivors. Additionally, the Honor Guard travels throughout the tri-state area to honor police officers who were tragically killed while serving their communities. The mission of HNT is to establish an ongoing dialog and rapport with people involved in a crisis situation. HNT gathers information on the people involved, compiles psychological profiles, interviews witnesses and provides intelligence analysis. 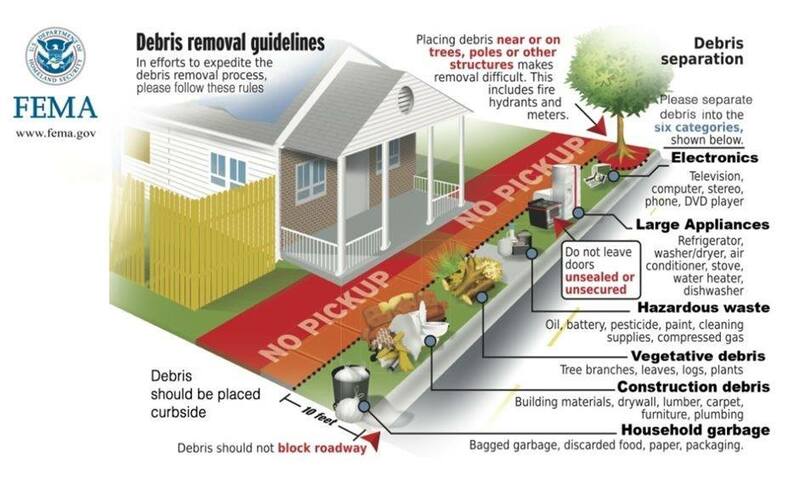 Collectively this information helps the negotiator to successfully resolve a potentially dangerous situation. The team currently consists of a Commander and 15 members. Team members have received specialized training from the FBI, the Georgia Public Safety Training Center, and the Institute of Police Technology and Management. Several members hold a three-phase certification in Hostage Negotiations from the International Association of Hostage Negotiators. Additionally, members receive inner-departmental training and participate in scenarios with the SWAT team members. All members are skilled in the use of a crisis and rescue phone and other specialized equipment, along with expertise in communications, active listening skills and intelligence analysis. HNT responds to many callouts each year and assists in the service of high-risk search warrants. The vast majority of incidents are resolved without further injury or violence. 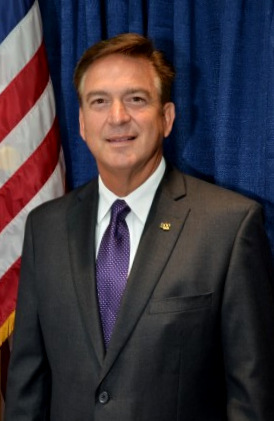 The SPD Hostage Negotiation Team also responds to assist the neighboring municipalities, other counties, and local agencies, such as Savannah State University, Georgia Southern University – Armstrong, and the Chatham County Board of Education. HNT works with SWAT in crisis situations to bring about a peaceful resolution in extremely volatile situations. The K-9 Unit started in September 2001 with the Savannah Police Department and included four K-9 team. The unit consists primarily of Belgian Malinois K-9 partners. With the exception of Ziggy, each canine is considered dual purpose. This means the canines are trained in both patrol work and narcotics detection. Ziggy is trained as a single-purpose gun detection dog. The dual purpose patrol dogs are certified in both patrol work and narcotics detection. Patrol work consists of tracking suspects/missing persons, searching buildings for suspects, locating evidence used in crimes, and apprehension of suspects. Narcotics certification consists of the canine being able to locate Marijuana, Cocaine, Heroin, and Crystal Meth in different environments. When the teams certify we are required to search inside of buildings, cars and in open areas. Members of the unit train once a week as a group to maintain the team's proficiency. Each handler also trains with his K-9 partner individually through the remainder of the week. The SPD K-9 teams are certified through the United States Police Canine Association and/or the Chatham County Sheriff’s Department. The gun detection training is focused on finding weapons. Gun dogs sniff out scents associated with firearms- oils, powder, and the residue of fired gunpowder. This training helps SPD locate weapons that have been hidden or tossed aside by fleeing suspects. 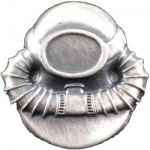 The gun dog certification is obtained through the National Police Canine Association. Sgt. Eric Dukarski has been with the Savannah Police Department since 1996 and has been on the K-9 Unit since it was created in September 2001. He took over as the K-9 Unit Commander in June 2013. Sgt. Dukarski trains all new K-9 teams. Cpl. Amanda McGruder has been with the Savannah Police Department since 1996 and has been on the Canine Unit since it was created in September 2001. Cpl. McGruder handles Gonzo, a dual-purpose Belgian Malinois. APO Mike Drayton has been with the Savannah Police Department since 1998 and has been on the K-9Unit since 2004. APO Drayton handles Ivan, a dual-purpose Belgian Malinois. APO Drayton also handles the unit’s first single-purpose gun dog Ziggy, a Dutch Sheppard. APO Benjamin Ferrero has been with the Savannah Police Department since 2011 and has been with the K-9 Unit since 2015. APO Ferrero handles Dooly, a dual purpose Belgian Malinois. Cpl. James Lyttle has been with the Savannah Police Department since 2003 and has been with the K-9 Unit since 2017. Cpl. Lyttle handles Oscar, a dual-purpose Belgian Malinois. Cpl. Amir Moustafa has been with the Savannah Police Department since 2014 and has been with the K-9 Unit since 2017. Cpl. Moustafa handles Sam, a dual-purpose Belgian Malinois. Cpl. Matt Jackson has been with the Savannah Police Department since 2012 and has been with the K-9 Unit since 2018. Cpl. Jackson handles Leo, a dual purpose Belgian Malinois. The Mobile Field Force originated in 2004 during the G-8 summit held in Coastal Georgia. It included five platoons of officers chosen to protect the city and maintain order from potential protesters. 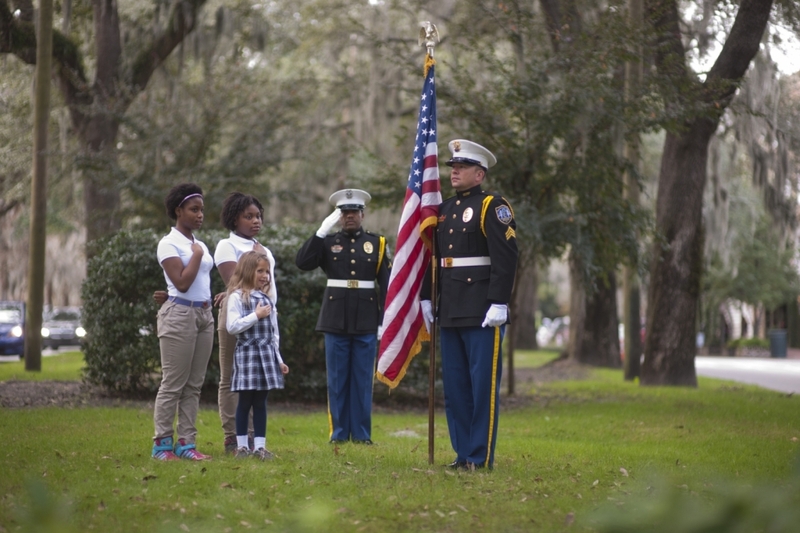 Savannah avoided the disruptions and destruction other U.S. cities faced during such summits. The primary duty of a Mobile Field Force is to protect the rights of all people to exercise their constitutional rights to free speech and protest and to address and quell any disorder from unlawful protests. Secondly, officers are deployed to cope with large crowds, loud noises and violence. One permanent Mobile Field Force platoon of volunteers was established in 2007. Alpha Platoon, or “the A Team,” maintains a high level of training, equipment and readiness to address any public disorder situation. Officers from the A Team have assisted other police agencies to form and train their field forces and have assisted the Army during preparations for domestic missions involving natural and man-made disasters that require the special skills required to confront groups of disruptive people. 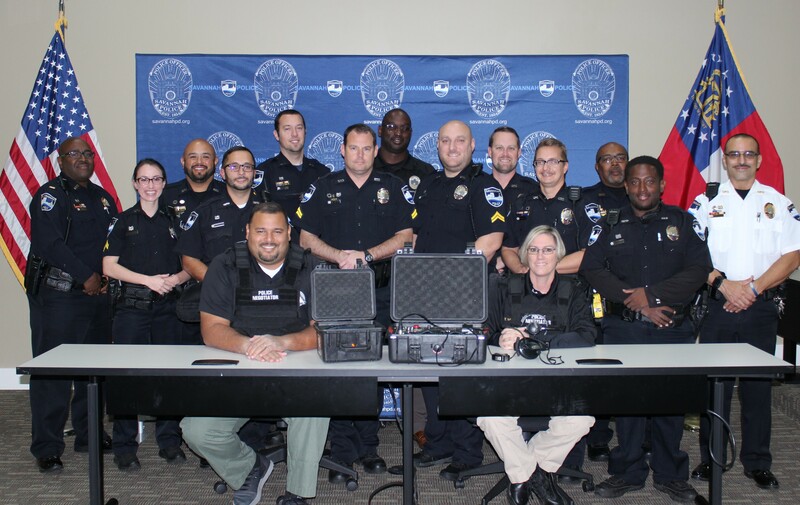 Approximately 50 officers are assigned to this unit, with at least as many more who have been members and who can be recruited in an emergency situation. These officers routinely function in many different divisions within SPD. The Savannah Police Mobile Field Force has primary jurisdiction in the City of Savannah. It is also available to assist any agency or location within the state of Georgia via interdepartmental Memorandum of Understanding and approval of the Chief of Police. Mobile Field Force has trained with Georgia Port Authority Police, Chatham County Sheriff’s Office and Georgia State Patrol, to name a few. The Mobile Field Force was included in securing the parade route during the inauguration of President Barack Obama in January 2009. Its officers also work long hours each year handling huge crowds during the annual St. Patrick’s Day Parade and Festival, the Rock and Roll Marathon and during other large events. In a natural disaster, these officers would be in the first wave of officers returning to Chatham County. 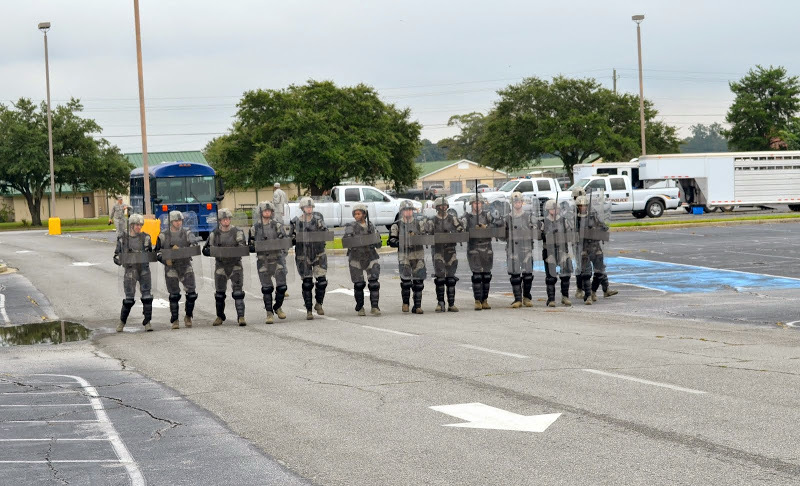 All officers of Mobile Field Force are trained extensively in control of large crowds through a variety of methods including verbal de-escalation, well executed maneuvers, and use of hands and weapons to include less lethal and gas munitions. Mobile Field Force has a large truck and trailer with which to transport gear to any incident. Additionally, the unit has a variety of weapons and protective gear to include batons, shields, helmets, gas masks and protective padded gear. Annually the unit hosts a multi-jurisdictional Riot Exercise (RiotEX). 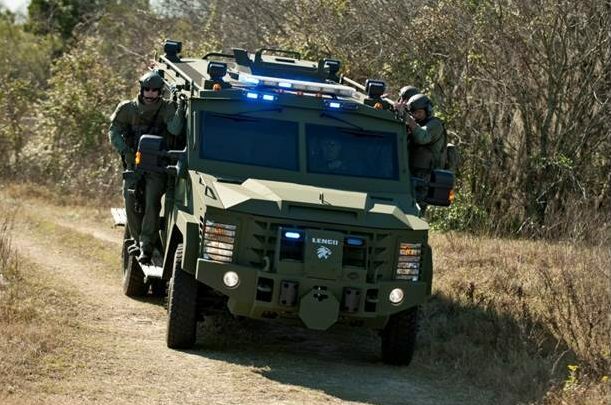 In 2014, RiotEx was attended by Mobile Field Force units from Georgia State Patrol, Chatham County Sheriff's Office and the 165th Airwing Security Forces. The former Savannah Police Department has a rich history with its Mounted Patrol dating back to 1796. Patrol units consisted of teams of horses and their riders, who developed strong connections with each other. Mounted patrols were disbanded in the early 1900s due to the prevalence of automobiles. Savannah operated without these units for more than 50 years, but in 1989, now-retired Police Chief David Gellatly successfully fought to bring them back. On July 22, 2014, the unit celebrated its 25th anniversary. Currently, the unit is comprised of six riders and seven horses. The horses are required to meet specific height, age and temperament requirements. All of the horses have been trained to deal with loud noises such as gunshots and sirens, as well as walk over objects that most horses wouldn't approach. The horses live, sleep and train at the mounted patrol unit stables off Dean Forest Road. Mounted Patrol is not only popular with the public, especially children, but they are also immensely useful as a tactical instrument in the face of an unruly crowd. Policing on horseback provides the flexibility to patrol areas that vehicles cannot easily reach, such as squares, parks and other pedestrian areas. It also provides a “perch” from which riders can easily observe crowd activities or look over walls and fences or areas that would go unnoticed by officers on foot or in patrol vehicles. 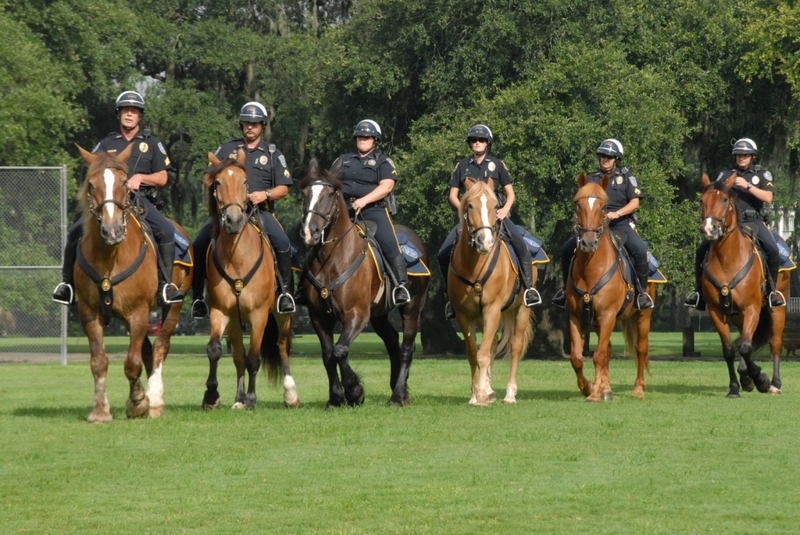 The Mounted Unit plays an important role with the Mobile Field Force Unit to control crowds, and the two units train together several times a year. The Office of Professional Standards (OPS), or Internal Affairs as it is commonly referred, believes in a “Community Policing” philosophy that promotes proactive problem solving and police community partnerships. These close-working relationships with the community enable police to establish public confidence in law enforcement. 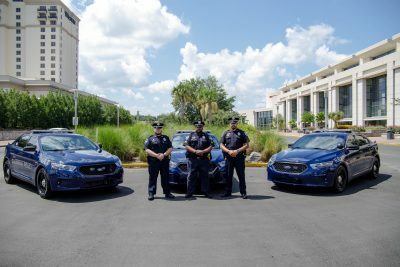 The Savannah Police Department demands a high standard of conduct and discipline from all of its employees (sworn and civilian) in order to preserve the necessary trust and confidence within the community we serve. The Office of Professional Standards is committed to conducting fair and impartial internal investigations on behalf of both the employee and the citizens of Savannah. The outcome of each case is based on an evaluation of the facts disclosed during the investigation. The Office of Professional Standards reports directly to the Chief of Police and is currently comprised of 1 Captain, 6 Sergeants, 1 Civilian Paralegal, and 1 Civilian Administrative Assistant and is located in a separate building from the Police Department. 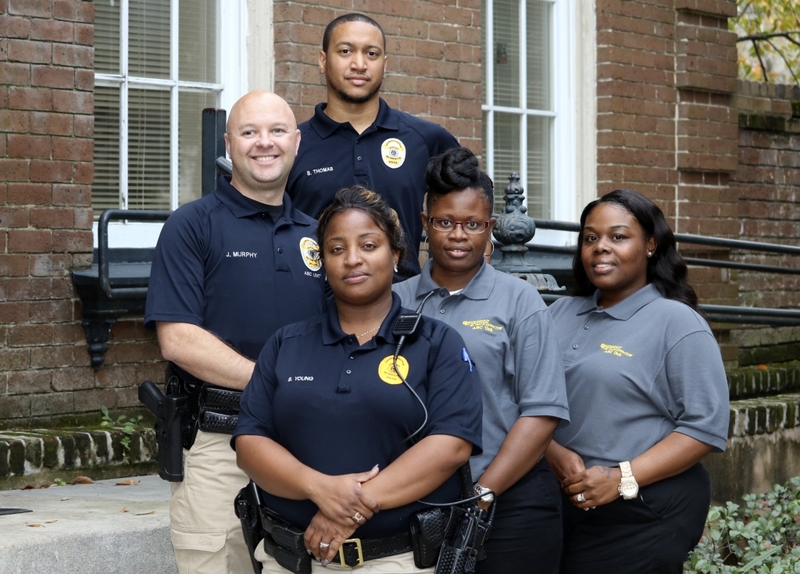 The Savannah Police Department's Reserve Officer program is comprised of dedicated men and women who serve to supplement the full-time sworn workforce of the agency. Reserves carry the same powers as sworn personnel and must meet all state requirements to maintain certification. This includes all state and departmental mandated training, and Reserves must meet a minimum quarterly service requirement. Reserves volunteer time and service to the agency and are not compensated either monetarily or through agency provided benefits. Currently SPD only accepts Reserve Applications from former sworn SPD officers, who left the department in good standing and are still GA POST Certified. PROTECT AND SERVE, BECOME A RESERVE! Public assembly means any meeting, demonstration, picket line, rally, or gathering of 100 or more people for a common purpose that interferes with the normal flow or regulation of pedestrian or vehicular traffic or that requires exclusive use of all or any part of public areas or facilities open to the general public. All fees and/or deposits shall be paid via cashier’s check or money order payable to “City of Savannah”. The Special Events Coordinator will review your application and determine what city services are required. In the late 1960s, several national incidents, to include the University of Texas at Austin when Charles Whitman took a sniper position atop the main building killing 14 people and wounding 32 and the Watts Riots in Los Angeles County, led law enforcement officials to evaluate how to minimize civilian and law enforcement casualties and resolve these incidents as quickly as possible. SWAT is designed to be a lifesaving unit. 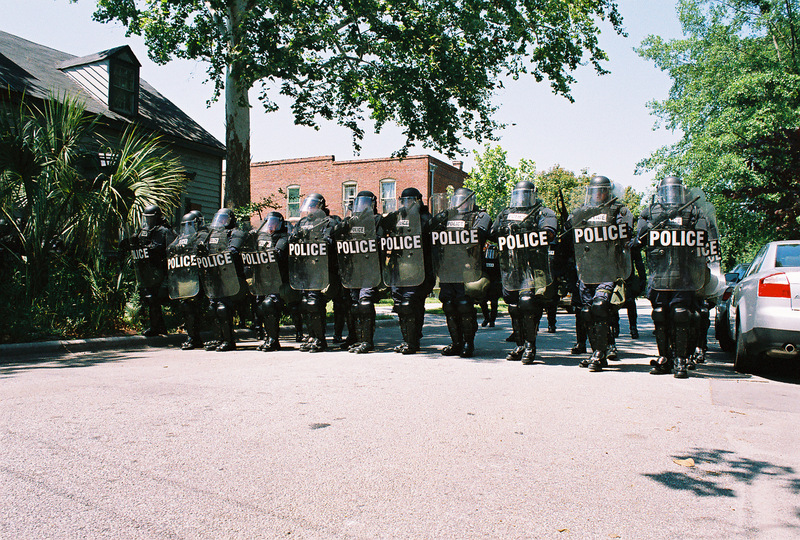 Just like the Savannah area, Savannah Police's SWAT Team has a long history. The department’s first special operations team was made up of one Captain and 100 privates whose main job was to capture chicken thieves after the Civil War. Since that time, the SPD SWAT team has developed and grown in many ways. Selection of SWAT Team members is based on many factors including minimum years of service with SPD , a combination of an exemplary service record, passing intense firearms evaluations, physical standards, stress test and an oral board review. SWAT is a collateral duty associated with normal assigned duties. The mission of the Traffic Investigations Unit is to solve traffic safety problems through partnerships with our citizens and other agencies. The Traffic Unit is made up of highly trained and proactive officers dedicated to the prevention of traffic accidents. Traffic Officers also provide funeral escorts, dignitary escorts and traffic control and coordination for special events like parades and demonstrations. How does the Traffic Unit Accomplish their Mission? The Traffic Unit focuses on education by informing the public of contemporary issues affecting public safety. The Traffic Unit utilizes engineering via its relationship with the City of Savannah and Chatham County Traffic Engineering departments, the Georgia Department of Transportation and the Governor's Office of Highway Safety. The Traffic Unit also uses enforcement of traffic laws and high visibility patrol as a means to gain voluntary compliance with the rules of the road. Traffic Unit Officers are required to complete a rigorous traffic enforcement/collision investigation course. All Traffic Unit Officers must keep their RADAR, LIDAR and other certifications current. Traffic Unit Officers also routinely train newly hired SPD officers in accident investigations and Standardized Field Sobriety Testing. The Traffic Investigation Unit (TIU) investigates all traffic-related fatalities and any collision that results in serious injury or extensive property damage. TIU investigators document and investigate all forms of evidence, including roadway dimensions, skid data, witness/victim statements, suspect interviews, etc. 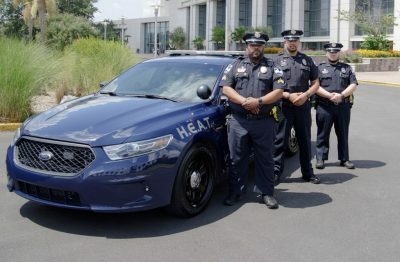 The Georgia Governor's Office of Highway Safety and local law enforcement agencies have come together to create H.E.A.T — Highway Enforcement of Aggressive Traffic — to combat impaired and aggressive drivers. The Problem: Aggressive traffic (a term that includes speeding and impaired driving) is one of the leading causes of crashes that result in serious injuries and fatalities on the roadways of Georgia. The Solution: H.E.A.T. is a multi-jurisdictional task force specifically-designed to combat aggressive traffic across Georgia. The H.E.A.T. Unit consists of three full-time officers and three H.E.A.T. vehicles. The GOHS awarded a grant to the Savannah Police Department to cover the expenses of two officers. The City of Savannah will continue to provide a grant match to finance a third officers and expenses within the unit. It is the Mission of the Savannah Police Training Unit to provide high quality training for our officers to help them better perform the duties required to meet the community’s needs. We facilitate professional and personal excellence, enhance organizational effectiveness and contribute to the current and future success involved in fighting crime with our community. The Training Unit strives to be the hub of quality training and professional development for the southeast region. Our goal is to enhance the abilities of our officers to be the premiere and elite role models for the community. The Training Unit is located in the SPD's Professional Development Center at 3401 Edwin St. The 20,400 sq. ft. facility consists of a 126-seat tiered auditorium, a large training/multi-purpose room, three 32-seat classrooms, a 20-seat computer lab, a critical incident management room, 12 administrative offices for training unit officers/staff, an executive conference room, an exercise room, locker rooms with showers and a break room. 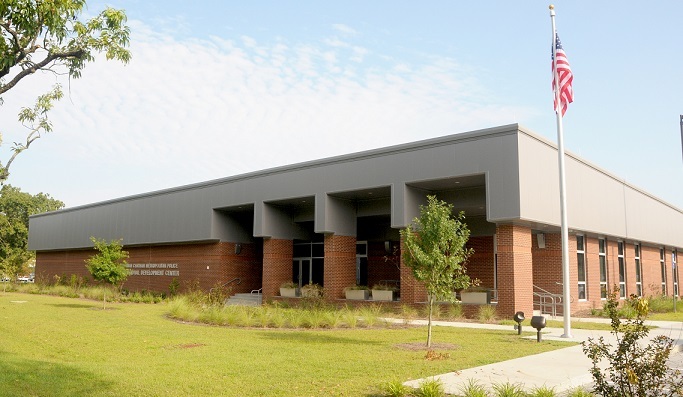 The building is equipped with energy-saving motion-sensor lighting; Epson BrightLink interactive projectors have been installed in each classroom. These projectors eliminate the need for electronic white boards. The auditorium, multi-purpose room and the computer lab are each equipped with digital LCD projectors. The SPD is proud to be a part of the Below 100 Initiative, which aims to lower the number of Officer Line of Duty Deaths nationwide to below 100. We have identified five key tenets by which we can improve officer safety—areas where we can make a difference. Below 100 isn’t about statistics. It’s about each and every officer, trainer and supervisor taking individual and collective responsibility for the decisions and actions that contribute to safety. For those in a leadership position, Below 100 means supporting a culture of safety throughout your department. Make doing the right thing so ingrained in your personnel that it becomes the norm and not the exception. Just as importantly, hold accountable those who stray outside what should be common sense. Often, a private word with a misguided officer is all it takes to correct his or her misperception. Below 100 is committed to providing you the tools and resources you need to make a culture of safety thrive throughout your department. Finally, Below 100 is a challenge that recognizes each officer death as a tragedy. It’s our duty to face down death and protect the innocent when called to do so. It’s a fact: Good cops will die each year. But working together—and only by working together—we can keep our streets and ourselves safer. 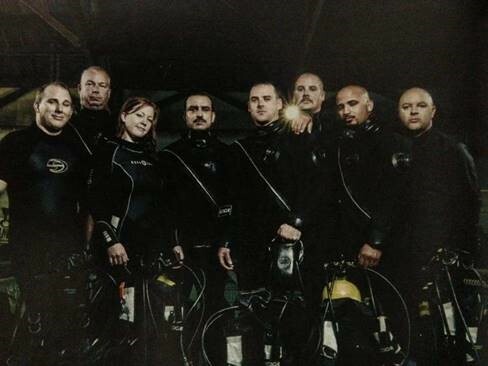 The Underwater Search and Recovery Team is an auxiliary unit to Savannah Police Department and often assists local and federal law enforcement agencies. The mission of the Underwater Search and Recovery Team is to respond to water-related incidents, such as drowning, underwater search and recovery of stolen property or other criminal evidence, conduct underwater Sweeps for VIP protection and/or high risk targets. The Team also performs ship hull searches for contraband/parasitic devices when requested. All missions are documented for the purpose of court testimony. The unit is well equipped for various types of underwater searches to include cold water, low or no visibility, and polluted or contaminated water. The team is equipped for standalone operations, such as with remote incident sites. The USR Team is equipped with a 30-foot Freightliner cab over truck. The truck is equipped with SAR dry suits, hardwired and wireless underwater communications with MK II mask and infrared underwater cameras. The USRT also operates an Underwater Robot.